Recent decades have witnessed the emergence of artificial intelligence as a serious science and engineering discipline. Artificial Intelligence: Foundations of Computational Agents is a textbook aimed at junior to senior undergraduate students and first-year graduate students. It presents artificial intelligence (AI) using a coherent framework to study the design of intelligent computational agents. By showing how basic approaches fit into a multidimensional design space, readers can learn the fundamentals without losing sight of the bigger picture. The book balances theory and experiment, showing how to link them intimately together, and develops the science of AI together with its engineering applications. Although structured as a textbook, the book’s straightforward, self-contained style will also appeal to a wide audience of professionals, researchers, and independent learners. 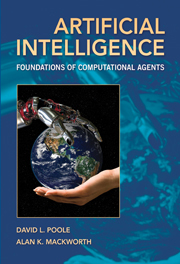 AI is a rapidly developing field: this book encapsulates the latest results without being exhaustive and encyclopedic. It teaches the main principles and tools that will allow readers to explore and learn on their own. The text is supported by an online learning environment, artint.info, so that students can experiment with the main AI algorithms plus problems, animations, lecture slides, and a knowledge representation system for experimentation and problem solving. "This book, by two of the foremost researchers in Artificial Intelligence, marks the transition of the field from a miscellaneous assortment of unrelated techniques to a genuine scientific discipline. It presents the fundamental concepts of AI in a coherent structure, which shows how different techniques are related and complementary. The book is written in a clear and engaging manner, which makes it suitable both for the serious student and for the intellectually curious layperson." "This book is a wonderful, well-written introduction to a field that is interesting to many, fascinating to some; a field that involves tremendous complexity. The authors manage the complexity by beginning with the simplest elements and building on these to progressively broaden and deepen the treatment. They provide a large number of references for those who wish to go beyond the text. [I] recommend this excellent work." "It has been about 15 years since the last major history, and a lot has happened. And Nilsson has a unique viewpoint: he has been a key early AI researcher, an influential lab leader, a AAAI president, author of three very different AI textbooks, and a teacher and department chair at a leading AI department. Furthermore, he has the disposition of a careful scholar and is not inclined to push just one viewpoint. From the beginning, his work has spanned the logical and probabilistic approaches to AI—he could give a more balanced overview than someone who has worked in only one of these camps. I wanted to hear his take on the history of AI. The Quest for Artificial Intelligence is more personal yet more comprehensive, and presents a more nuanced appreciation of the place in history of each event. Make no mistake: this book is a history—a true quest." "There are several AI textbooks on the market at the moment with the same target audience but one of these books—by Russell and Norvig—is dominant, almost completely so, and is used in approximately 1100 universities in 100 countries. Over the years, I have taught from earlier editions of the texts by Luger and by Rich, Knight, and Nair. Like many, I switched to the text by Russell and Norvig (hereafter R&N) shortly after the first edition came out in 1995. R&N is an excellent and highly regarded text. Yet after more than a decade of teaching through three editions of R&N, I recently switched from R&N to the new text by Poole and Mackworth (hereafter P&M). Let me explain why. R&N has aimed at being comprehensive and is not as selective. The result, I believe, is that the book has become overly long and less integrated and less useful to the average student. Some topics and chapters in R&N contain much more material than can reasonably be covered in an introductory course that aims for breadth (as many AI courses are structured). The result is often unsatisfying for the instructor and students find it difficult to wade through the extra material to find what is relevant for their course. P&M, in contrast, is more selective in its coverage. In summary, I highly recommend this book to instructors of introductory AI courses and to those who wish to learn about the foundations of the field through self-study. As many will be aware, there is already an excellent textbook by Russell and Norvig with the same target audience that has dominated the field for more than ten years. However, all things considered—selective coverage, level of detail, quality of explanations, exercises, online materials, free availability, and so on—I believe the clear advantage goes to the newcomer. Certainly the book sets a new standard for AI textbooks with its supplementary online tools and tutorials."